Wooster Pro cage frame mini rollers make painting easier. The greatest appeal is for small jobs that typically, in the past, would have required a brush. Cage frame mini rollers are lightweight, fast and easy to use. They're great for any area with a lot of fixtures, trim or windows resulting in small wall spaces. Keep cage frame mini rollers in mind for these painting projects; kitchens, baths, closets, hallways, cabinets, moldings and cutting-in trim work. 10 pack of 4" mini extra high density foam rollers for smoother bubble free finish. Rollers conform to irregular surfaces. Excellent for trim and small jobs, doors and tight areas. 4-1/2 in. x 1/4 in. 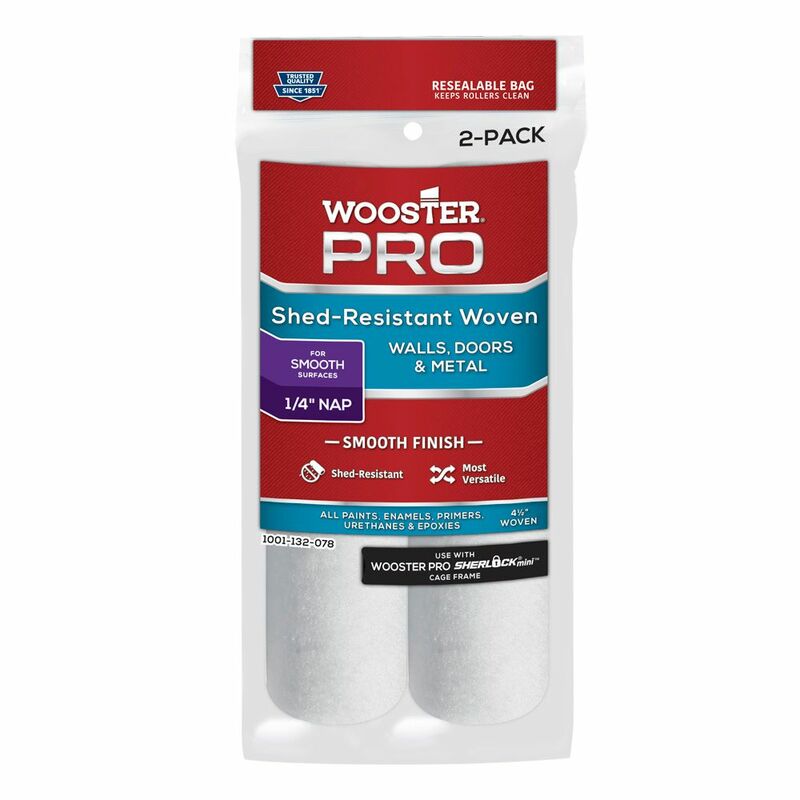 (115mm x 6mm) Wooster Pro Woven Mini Roller Cover (2-Pack) Wooster Pro cage frame mini rollers make painting easier. The greatest appeal is for small jobs that typically, in the past, would have required a brush. Cage frame mini rollers are lightweight, fast and easy to use. They're great for any area with a lot of fixtures, trim or windows resulting in small wall spaces. Keep cage frame mini rollers in mind for these painting projects; kitchens, baths, closets, hallways, cabinets, moldings and cutting-in trim work.